Wow...what a week. We enjoyed beautiful weather most of the week. A little bit of rain, but we lived with it. We are finishing up our end of the study of the Periodic Table of Elements with Ellen McHenry's Basement study. This was such a detailed program, and it is really wonderful. Very much over the kids understanding of science. But if you have a kiddo that LOVES and wants to learn the Periodic Table in depth, this is definitely the program you want to use with them. Very easy to use and lots of experiment ideas. I only had to order one chemical, so pretty easy supplies to have on hand. This week we finished up by doing experiments. We did a variety, including trying to check the iron in cereal. Using vinegar to clean the pennies. Making a battery with vinegar, coins, and paper towel. Melted aluminum foil.... this was very cool to watch and also very stinky! This was for fun... mentos and diet coke. Brayden has his 4H demonstration this week. He chose to talk about the casserole section of his Race Around the Clocks meal project. We have added two of the recipes he has made to our meal rotation. One of them is a shredded potato casserole. He handed out a chart on how to make an easy casserole in just a few minutes with items you have in your cupboards/fridge. Considering his speech issues, he did really well. More 4H projects.... Brayden wanted to have a BBQ with some friends. So we took advantage of that. Caty made butterscotch bars from her book. Joey made two types of pumpkin bread for people to test. Spring sports are starting up. Both the girls are doing soccer. And all the kids are doing tennis. The girls were so excited to be back playing soccer. Lydia is working on her bracelets for her Silver Award project. It's a slow going process. One of our chicks fresh out of the incubator. Playing soccer with her friend. Another friend and I were walking at the fairgrounds and the kids were all playing in the gorgeous weather. Lydia was invited to attend a Girl Scout Awards banquet. Last year she finished her Bronze Award as a Junior Scout. That night she earned a neat patch and was able to meet the CEO of Girl Scouts of Western Ohio. She and Bradie doing their presentation. They even coordinated their outfits. Through all of this craziness, the kids worked on math review for the end of the year. Joey continued his Specialized Life math program. The kids all spent two weeks reading Charlotte's Web for their assigned reading. They all really liked the book. But since it was "longer", I split it up over a 10 day period to make it not feel overwhelming since they have comprehension questions to answer. I love playing puzzles online. 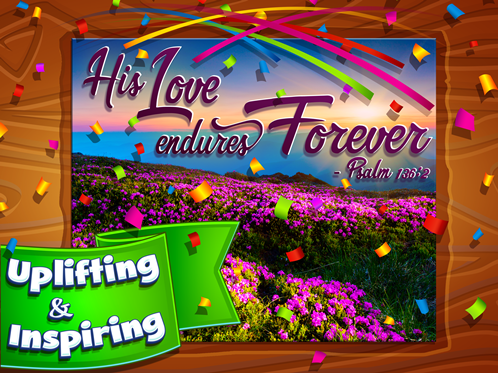 I recently had the opportunity to review the Daily Bible Jigsaw Puzzle app from Planet 316. Now I have puzzles on the go!! Each puzzle includes calming background music and a scriptural reminder who to turn to with the stresses of the day. 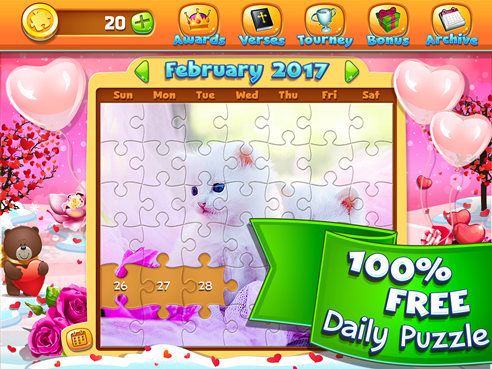 You play one puzzle daily for free. But you can play more puzzles each day using coins, and re-do past puzzles. Usually its 2-3 coins to play the puzzle. But you can actually earn coins through playing different pieces, such as power pieces. Another way to earn free coins is to watch ads for other online games that you could play. But if you would like to, there is also the option to purchase more coins in various amounts. It ranges from 55 coins for $4.99 all the way to 780 coins for $59.99. Each puzzle takes roughly 5 - 10 minutes a day, depending on how distracted I was while working on it. I used the version of Daily Bible Jigsaw Puzzles on my IPhone from the Apple App Store. It was very easy to download. 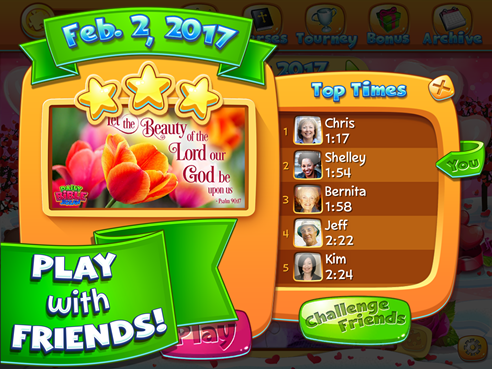 You can also Play with and Challenge Friends that are also playing the Daily Bible Jigsaw Puzzle program/app. I do not keep a lot of games on my phone. Generally it's overloaded with pictures...lol. But one day, Lydia even grabbed my phone and was looking for something to distract her. I opened this app, because I knew I didn't have to worry about it having inappropriate material. She really enjoyed the puzzles she played also. The puzzles are beautiful. I have really liked every puzzle that I have solved, whether it be nature scenes, animal, flowers or even children playing. The pictures were beautiful each time. In this day and age of negativity, it seems like many of the apps and games center around negativity and fighting of some sort. It's great to have this option. One that I do not mind allowing my children to play also. Planet 316 has definitely impressed me with the Daily Bible Jigsaw Puzzle app. It will remain a constant on my phone. There is no cost to download the game, but there are in-app purchases for extra coins. This is completely optional. But if you do have children playing, be sure to have purchases passcoded in your device. I did watch a couple of ads during the review period, just to make sure the ads that you watch to earn coins were family friendly, and I did not see anything inappropriate. If you are looking for a brief, inspirational distraction, Planet 316 has definitely created a great program with the Daily Bible Jigsaw Puzzle. Several members of the Homeschool Review Crew were given the opportunity to try out the Daily Bible Jigsaw Puzzle in various formats. Click below to see how they used this program and what they liked about it.